VOL. I NO. 30 REG. NO. L5015 DELHI, THURSDAY APRIL 8, 1943. BOMBER BASE BEER BUST After months, a stock of beer finally found its way to an India air base. 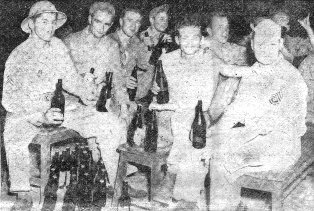 These sergeants pooled their rations of brew and then went to work to get themselves in this variety of moods. Left to right: S/Sgt. William W. Henry, M/Sgt. Thomas Christie, S/Sgt. Victor Blaine, S/Sgt. Henry W. Rawlings, S/Sgt. Gerald L. Hathaway, S/Sgt. R. M. Kramer and 1st Sgt. Joseph W. Meier. The Jap in Burma was harried by both the 14th and 10th Air Forces during the past week and suffered heavily in two major operations. First, fighter pilots of the 14th Air Force scored a brilliant victory over the enemy in a defensive action, April 1, when nine Zeros attempted an attack upon an advance base in Kiangsi Province, in China. Intercepted near the field by P-40's, the Japs were struck a devastating blow during a brief, but bitter, fight. Seven Zeros were destroyed and the remaining two were badly damaged. Our loss during the engagement was one pilot killed; there were no other losses sustained in personnel or equipment. Secondly, more than 13 tons of bombs were showered upon the important Thilawa, Burma oil refinery south of Rangoon April 4 by B-24's of the 10th Air Force. The refinery only recently restored to operation and vital to the Jap oil supply in Burma, was struck a heavy, accurate blow. Direct hits upon buildings and storage tanks fanned a blaze that could be seen 50 miles away. On March 31, a B-25 formation attacked the railroad yards at Pyinmana. Direct hits were reported on warehouses and also on the railroad tracks near the central station. Our B-24's, attacking the same target, were intercepted by a large formation of enemy fighters, at least two of which were shot down. From all these operations, one of our aircraft is missing. An April 1 communiqué from the 10th Air Force tells of successful operations on March 30 and 31. Formations of B-25's attacked enemy railroad facilities at Maymyo and destroyed machine shops and repair sheds, March 30. On the same day, several formations of P-40's armed with machine guns and light bombs achieved good results against installations in northern Burma. An April 3 communiqué from the 10th Air Force relates successful forays on April 1 and 2 and March 31. On the latter day, medium bombers attacked the railroad yards at Maymyo, and heavy bombers set fire to Pyinmana warehouses and dropped bombs on railroad bridges at Pyinmana, Satthwa and Kantha. These heavy bombers were intercepted, but got two confirmed Japs, two probables and damaged three of the enemy. On the first day of the month, B-25's bombed the railroad yards at Ywataung. The following day, the same medium bombers attacked the enemy-held railroad installations at Thazi Junction, Burma. The same communiqué which told of the attack upon the Thilawa oil refinery added that on the same day that B-25's raided railroad installations at Maymyo and the day previous that the Myitngne Bridge area was struck by medium bombers. The troopship edges into the dock and happy soldiers wave as they wait eagerly to go ashore. 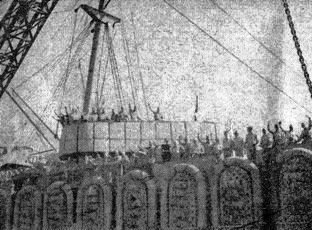 Nurses came, too, and they were among the first to disembark. Steel-helmeted G.I. 's pack off their own gear. The weather was warm and they soon changed to cooler clothes. G.I. 's swarm the streets as they set out to see the town. Cafes and bars like this attracted many of them. These fellows couldn't wait to get their money converted at the Army finance office, so they hiked to the nearest money changer. 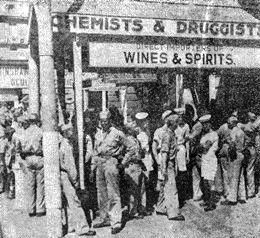 There's no alcoholic drinking on a troopship, and liquor stores did brisk business. Some soldiers did their sight-seeing in gharries, as gas rationing makes taxi fares virtually prohibitive. A picture from India to send to the folks. A U.S. sailor and three staff sergeants pose. Indian currency is larger in size than U.S., so these privates buy wallets from a street vendor. A newly-arrived Army nurse shops for silk stockings. 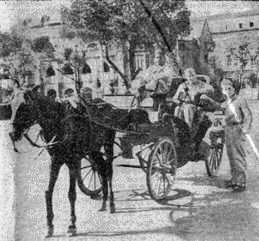 After seeing the town, troop trains take the fellows to their new stations. Anyway, they've had fun. WASHINGTON - The Senate confirmed President Roosevelt's nominations of Brig. Gen. Clayton Bissell and Brig. Gen. Claire Chennault, commanding generals of the 10th and 14th Air Forces, respectively, to be major generals. The Senate also concurred in the nomination of Col. William Bergin, Theatre G-1, as a brigadier general, who thus becomes the Theatre's newest general officer. A cocktail party was given recently by H.E., the Bengal Governor and Lady Herbert for officers of the India Air Task Force. The boys swarmed in from the countryside for the occasion. Her Ladyship: "Well, young man, where are you stationed?" Young man: "Up the line aways." Her Ladyship: "Where did you say?" General Haynes: "Quite right, Lieutenant, but this lady is the wife of the Governor of Bengal. By the way, what field ARE you from?" Young man: "Up the line aways, sir." 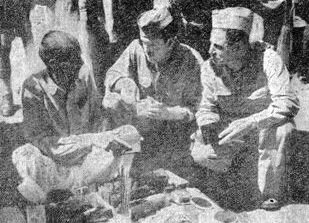 CHINESE-AMERICAN TRAINING CENTER - A small group of Chinese soldiers, half starved, clothes ragged and torn, feet blistered and sore, arrived in India recently, thus ending a harrowing, danger-filled journey that started from behind enemy lines last year and carried the group through Jap-infested jungle country to safety. The Chinese lived with friendly villagers, working for food in the fields, after a Japanese break-through in 1942. Arrangements for escape was made in mid-February and jelled when it was learned that 15 Chinese just a few weeks earlier had successfully made their way to India. BARI BLOSSOMS With "Bozo" watching, Lynn Bari makes a big splash after signing a new contract that brings her from chorus lines, bit parts and B-picture leads to first-class film roles. In fact, Lynn's studio bosses can't figure out why she wasn't a star long ago. to complete. Extreme precautions had to be taken to avoid possible enemy patrols. The last stage of the journey was made over a narrow mule track, hardly passable to bullock carts. Three days later, the party arrived at Layshi, where British troops intercepted and looked after them. Development of dive-bombing tactics by fighter planes - tested under combat conditions - was one of the most important features of the 10th Air Force's March campaign against the Jap. Maj. Gen. Clayton L. Bissell, commanding general, stressed the point during his monthly press conference, adding: "There was developed a high degree of skill in placing bombs with accuracy on small precision targets." Bissell said that during the month U.S. airmen in India and China carried out 18 percent more missions and dropped 80 percent more bombs than during the preceding month. During these operations, he announced, 10 enemy aircraft were destroyed, four were probably destroyed and at least 12 were damaged. Our losses were four planes. No enemy attack was launched against an American base during the month. Bissell emphasized that no train passed over the Myitnge Bridge during the month, although it has been repaired by the Japanese. 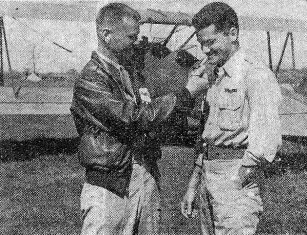 RESCUED AND RESCUER Lt. Ira M. Sussky (right) gets a light from Lt. Melvin Kimball after Sussky's thrilling rescue of Kimball, who was forced down in Jap territory in Burma. Sussky made the rescue in the unarmed trainer plane seen in the background, while fellow pilots in P-40's held off the Japs with machine gun fire. 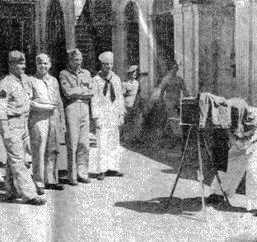 Col. Homer L. Sanders, guiding genius of an Assam fighter group which has been a painful thorn in the side of the Jap, stopped off long enough in New Delhi en route home to Houston, Texas, for an encouraging press conference. When the colonel left the room, reporters re-read their hieroglyphic notes with satisfaction. He had, as one of them expressed it, "said a mouthful," with no attempt to parry questions. Sanders' pilots in Assam dealt out death and destruction to the Jap in Burma in a measure overwhelming to slight American losses. Sanders revealed that since the group first mustered full strength last October, it had shot down 21 confirmed enemy planes, had a probable list amounting to 25 and had definitely damaged 13. The skimpy Jap side of the ledger was one American officer killed and two planes lost. Principal mission of Sanders' unit was to protect planes supplying China. This they accomplished by combat actions of offensive nature, as well as those of defense. "Not to defend, but to fight is my credo," thundered Sanders. The colonel was not disparaging about the Jap pilot, "You can't question his courage," he remarked. "He is always willing to engage in a fight. But, unfortunately for him, his plane is only good enough for a nice Sunday afternoon ride. The controls tighten up at top speed. He has no armor plate. No self-sealing gas tanks. The odds are against him from the start." Sanders scanned the room of correspondents for Bill Fisher, of Time magazine. Fisher was absent. The colonel revealed jokingly that his Assam fighter pilots want a word with Fisher, who wrote a piece about how, not having dangerous tasks at the time, the lads spent a couple of weeks ho-humming through routine strafing missions. "Hell, strafing is the most dangerous job of all to perform," he grimaced. Sanders amplified the story of the pilot rescued last week by a trainer plane and P-40 defenders near a Jap headquarters. He said: "The pilot never realized until near the end of the episode that he was near enemy headquarters. He thought that the river was one near his own base. He wandered into the town, but nothing happened. The Jap must have thought him a trap. In this village, he saw holes 20 feet deep, attesting to the effectiveness of our bombing missions there. Finally, he grew suspicious and took his .45 out of its holster, watched warily and awaited the rescue plane. "After wards I asked my A-2, a former Hollywood scenario writer, whether he would bang out a script on the episode. 'No,' he told me, 'no one would believe it.'" INDIA AIR DEPOT - Tons of vital war materials are flowing into eastern India and China daily from the huge American supply maintenance depot, which less than a year ago was only a gleam in Uncle Sam's eye. It will be some time before quantities of supplies large enough for an all-out offensive against the Jap flow forward, but that time is coming as surely as the monsoons. The stream of war essentials, such as planes, trucks, motor parts, ammunition and foodstuffs, is becoming wider, deeper and swifter. A few months ago, it was only a trickle. Col. John L. M. des Islets, 41, Berkeley, Calif., depot commanding officer, said in an interview: "We are getting into the groove after months of tedious preparation and hard work. Our engine maintenance production is already six times what it was scheduled to be by now - and four times what I thought it would be." The colonel - a tall, black-haired West Pointer who resigned from the Army to become a civil engineer, then rejoined the service two years ago, talked about the depot's growth as a father would about his son. He saw it develop from an idea on paper into one of the largest such depots outside the United States. He is proud of his "baby" - and he has a right to be. BOTTLENECK BREAKER There's no longer a bottleneck in unloading heavy equipment from our ships at a West India port. This huge crane recently arrived there and immediately broke that bottleneck. It weighs 80 tons, has a boom 87 feet long. The hook and block used to pick up equipment is 7 feet long. When des Islets first came here in June, 1942, he could see nothing but cows, grass and natives. Now there are several hundred buildings (including barracks and smaller structures), a fine airport with runways long enough for the biggest planes, and thousands of workers on the job day and night. Facilities are being expanded constantly to handle the increasing movements eastward. This depot is a classic example of what Americans can do when they put their shoulders to the wheel. They started from scratch. They taught Indians how to get work done in the good old American way. The caste system was abolished. If an Indian did better work than others higher on the caste ladder, he was put in charge of a construction crew. many Indians now work alongside Americans in offices and maintenance shops, thus leaving soldiers free to do jobs that the Indians can't. Depot construction started last year amid the monsoons. Capt Francis R. Fee, 33, Tulsa quartermaster, said he traveled one place to another by raft and frequently found water a foot deep under his bed. Thirteen native villages had to be removed. The Indians didn't object because they received money to build better villages. But they balked at cutting down sacred trees, one of which they left between two railroad tracks. "If you cut the trees, you'll be helping win the war," the Americans contended. The Indians closed their eyes and swung their axes. Men in the maintenance shops do everything but make it. Every month they overhaul approximately one-sixth of all planes in the C.B.I. Theatre. If they don't have certain parts in stock, they turn out substitutes on machines made in places such as Philadelphia; Chicago; Milwaukee; Portland; New York; Dayton, O.; Southington, Conn.; and Detroit. Lt. Col. George E. Schaetzel, 32, Alahambra, Calif., technical executive, said: "The monsoons won't affect us much, because we built the depot with the monsoons in mind." Other depot key officers include Capt. Clyde J. Hall, 41, Tishomingo, Okla., administrative executive; Capt. Stuart R. Peterson, 45, Minneapolis, security; Capt. Howard H. Lock, 29, Lockhart, Texas, air corps supply; Maj. Roy H. Cantrell, 40, Dallas, surgeon; Maj. David T. Stafford, 44, Corpus Christie, Texas, administrative inspector; Maj. Bernard A. Grant, 50, San Francisco, operations; Capt. Earl B. 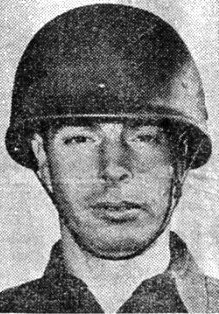 Van Blarcom, 34, Bessier City, La., finance; Maj. Charles W. Yerkes, 44, Maplewood, N.J., ATC control; Lt. Robert M. D. Hicks, 23, Los Angeles, adjutant; Lt. Frederick H. Levenhagen, 26, Bloomfield, N.J., construction petroleum supply; Capt. William R. Gallant, 45, Eastport, Me., signals; and Capt. John W. Clegg, Jr., 34, Philadelphia, civilian employment officer. Have you ever had Epidermophytosis? It's what the one-armed paper hanger had and over here is known as dhobie itch, athlete's foot or jockey-strap itch, according to Maj. L. C. Bevil, Asst. Theatre Surgeon. You probably haven't been particularly bothered with these things since you turned in your gym suit at school but here in the Orient they seem to be as commonplace as the lack of women. The cause of these various troubles is the presence of one or more fungus growths that thrive like mistletoe on a cottonwood tree but lack the sentimental appeal. The symptoms are obvious. If you see a guy scratching all over the place with a look on his face of supreme frustration when he can't reach that spot between his shoulder blades you know he's hooked. There will be red, slightly swollen itching patches on the skin most frequently in the groin and on spots of the body which stay moist from perspiration or where clothing is in close contact. When between the toes the skin appears grayish and cracked. The cracked parts are tender and itch. Source of infections are as follows: (1) Clothes and bath towels infected by dhobies direct from their own skin infections and by their method of laying laundry out on the ground to dry; (2) Contaminated shower and bath floors; (3) reinfection from our own shoes. Daily baths during warm weather is up at the top of the prevention list. The skin should be carefully dried - we might say even tenderly dried - being sure that every square inch of the epidermis gets your personal attention. Use talcum powder generously between toes, in groins and armpits. Change your undies daily, girls. Expose clothes and towels to direct sun rays before using. Wear wooden shower slippers while bathing - you can also use them for toy boats in your bath tub. Clean your tub - or had you forgotten - using bleaching powder or solution thereof. Decontaminate shoes after athlete's foot with 3% solution of formaldehyde followed by 24 hours drying, part of which should be under direct sun rays. Treatment consists of a lot of silly things that take up a lot of time and are neither interesting to the victim nor the creaker. "This year Army Day finds the Army forces of the United States fighting on many fronts with unity of purpose and a spirit to win which has characterized our forces from their organization under George Washington to this date. "This same spirit will carry us through the hard battles that lie ahead. The strength, determination and dauntless courage of our Army, ground and air, will continue to carry the fight to the enemy." 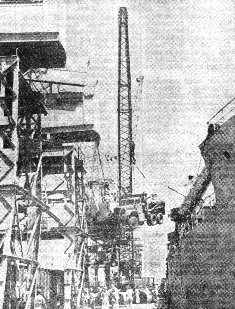 WASHINGTON - Cargo shipped to American troops overseas during the first year of America's participation in World War II averaged 82 pounds per man per day, according to an announcement by the War Department. This was almost twice the amount for a comparable period in World War I, during which cargoes averaged 43 pounds per man per day. 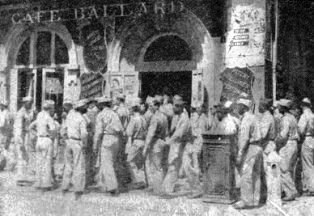 The announcement stated that 891,827 troops embarked overseas during the first 12 months of World War II as compared with 366,601 during a comparable period in World War I. 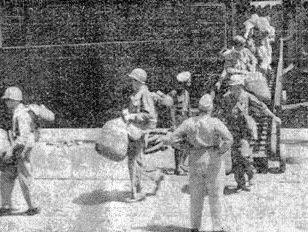 It was also stated that 10,474,923 measurement tons of Army freight were shipped overseas during the first year of World War II, compared with 1,725,000 during a comparable period in World War I. The U.S. Army in France, at the end of World War I, had 241 tanks, supplied chiefly by France and England, whereas almost that amount have been shipped in a single transport in World War II. HQ., INDIA AIR TASK FORCE - This headquarters was made loud last week by the presence of Capt. Carman H. (Doc) Sutley, the amiable grind-and-fill merchant of the Dental Corps. Down on a flying visit from his home station with a bomb unit, the good Doc ran into a veritable forest of faulty and unserviced teeth, ended up putting in a whole week in our midst. Clad in a white shirt, khaki shorts, and abbreviated boots without socks, he laid out a couple of trunkloads of shiny and evil-looking hooks, rasps and clamps and went to work. Nor would he stand for any remarks about an unmilitary appearance - "Not military," he roared in the famous Sutley tones, "Why I drill all day and March all night, don't I?" And indeed he could be seen "on the march" in town after a hard day of filling fangs, trying to get rid of that "down in the mouth" feeling. He was a good man to have around. Come again soon, Doc, we don't brush our teeth twice a day, so you can't afford to see your patients just twice a year. The baseball season ended abruptly here the other night, and a severe blow was dealt to the incipient muscle-building campaign. To wit: Pvt. Donald Travers picked on a low one inside and fractured the last remaining bat. This week, linked with the other circumstances of end-of-the-month and an acute beer and cigarette shortage, occasioned an epidemic of idle aimlessness, sundry staring into space, etc. T/4 Harold Fioravanti and Sgt. Elmer Lamond were even seen playing chess. Argument over whether or not the Asiatic Theater Ribbon was proscribed by an order banning "unauthorized ribbons" was emphatically settled by an unidentified G.I., who pointed out that no one had seen any orders "unauthorizing 'em." WASHINGTON - The United States Office of War Information announced that the total casualties of the United States Armed Forces since the outbreak of war through March 26, total 73,685. This includes 11,330 killed, 12,945 wounded, 40,622 missing and 8.788 made prisoners. The Army reports 49,133 total casualties, including 4,384 killed, 8,299 wounded, 27,662 missing and 8,788 prisoners. This total includes 12,500 Philippine Scouts, of whom 496 were killed, 747 wounded and the remainder assumed to be prisoners. Of the Army wounded, 830 have returned to duty. The Navy casualties, including those of the Marine Corps and the Coast Guard, total 24,552 which includes 6,946 killed, 4,646 wounded and 12,960 missing. Recall the day I flew away . . . ? "Be still, Child-heart; it's true he's gone. "And to refuse him, I'll not do . . ."
Of my return from skies of war? But I'll return through blizzard shrouds. Across the deserts no man knows. To mould our love to your desire. Did you ever have the crud? We won't tell or even ask "why?" We wanna know, "What is the crud?" Is it a cold or a fever too? Is it something that makes you blue? Is it a thing that aspirin can cure? Do you get it from being bad or pure? We really mean, "What is the crud?" Won't help us find, "What is the Crud?" They'll tell us, we know they will. Our minds are fuddled and as clear as "Mud"
Please help us out - "What is the crud?" - Corp. HENRY W. ASHER Jr. In the Spring of "forty-two"
A fine little town, we came to stay. And of course, the girls stayed clear. Not a "chick" was there to be. Rupees, annas, we spent fast. Was the Khaki's famed throat odor. With the gals who wouldn't romance. All the year, the Khaki's worn. But where's that Miss for us to woo? Then, romance would be the play. Beautiful moonlight - no can miss. Where the family trusts that Miss. 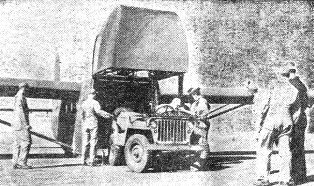 - Corp. LEE E PLEASANTS Jr.
FREIGHT - CARRYING GLIDER A jeep is backed under its own power into a giant glider at an Army Glider Training School on the U.S. Pacific Coast. The nose of the transport plane lifts up to allow large freight to be loaded. STRICTLY G.I. Jolting Joe DiMaggio, the Yankee great tries on a form-fitting G.I. helmet for size. With DiMag' in the Army, American League pitchers will have an easier time of it this year. WASHINGTON - The pendulum of power in Washington has made some dizzy swings in the last eighteen months. As a timekeeper, it hasn't been even dime-store quality, but as an indicator of whom is winning Washington's war-within-a-war, it's been as trusty and accurate as the best clock on the market. Washington's war-within-a-war has been conducted with all the political equivalents of guns, planes, and tanks - with a little poison gas being released now and then. Opponents in this "little war" - on one side, the military; on the other side, civilian officials. main battlefront for too many weeks and months was the WPB and its alphabetical predecessors. Extremists on one side wanted the military to run the whole show. Extremists on the other side feared military dictatorship of the government. Both sides wanted to win the war against the Axis - but each wanted to win it in his own way. Strictly neutral was Franklin Roosevelt, who when he has seen the power pendulum sitting for too long in one camp, has given it a push. A fortnight ago, Franklin Roosevelt wet his highly politically-sensitive finger, held it up and saw which way the wind was blowing. It was time for another push. The President, aided by such moderates as Gen. Marshall, Bill Knudsen, Donald Nelson, Barney Baruch, Brehon Somervell and Hap Arnold - all of whom understood and appreciated the problems of both military and civilian officials - has had to push the pendulum several times. A majority of the pushes have been in favor of the civilian side which lacked the tight organization, complete planning, and autonomy of operation enjoyed by the military. Most notable pushes were: appointment of civilian Donald Nelson; transfer of Bill Knudsen from civilian status to the rank of lieutenant general; subordination of Selective Service to the War Manpower Commission; continued establishment of civilian war agencies free from military control. For a long time it looked as if the military had definitely lost out, and its proponents did not hesitate to assert that this was the cause of inefficiencies in the production program, and delays and disappointments on the battlefront. How right or wrong they were was a problem for Plato. But things have happened in recent days. Military promotions hatching for a long time, have come out. Conferences of chiefs of staff are becoming much more important than conferences of bureau heads. Many government agencies have voluntarily set up joint boards with the Army and Navy. Other agencies have been instructed to work hand-in-hand with the military. WPB, the government's most powerful civilian agency, has worked out a compromise with the military on classification of vital war materials. Two civilians well-liked by the Army, J. A. (Cap) Krug and Sherrod E. Skinner have been appointed to run, respectively, the requirements committee and program adjustment, and the industry division of the WPB. America's part in the war is steadily moving from a production and home-front-adjustment phase to the real fighting phase. An organization like the Army Air Force, for example, inevitably increases its influence in Washington, as its personnel and equipment mushroom in size. When the War Department can announce that in January, February and March, U.S. Army planes shot down 384 Japanese planes and lost only 54, there can be little argument about the growing strength of the military, both in Washington and abroad. But if the Army and Navy were finding new powers in Washington, they were taking on new responsibilities. To amiable, jovial Hap Arnold, now a full general, fell the task of explaining the seemingly ironical situation in which the United States is producing planes by the tens of thousands, and China can't get the few which it asks. From Washington to the West Coast, Madame Chiang was winning the hearts of Americans as no other foreigner has ever done. 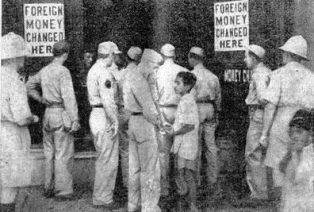 Never was sympathy for China, and the public demand for greater immediate aid to the Chinese, at a higher peak. Official Washington, although it felt that everything is being done for China that can be done at the moment, couldn't help blushing and having a false sense of guilt when it tried to explain why China's needs aren't being met. Just back from China where he studied the situation, Arnold knew there was no reason to blush or feel guilty. Factually, calmly, he gave the answer. There are not enough planes yet. Operational hazards on the India-China airline are terrific, China has no fuel. Said he: "A huge number of planes cannot be sent to any one theatre without taking them away from another . . . Our men must fly across mountains higher than the Rockies . . . Every gallon of gasoline used by our forces in China goes in by air. Each cargo plane must carry - in addition to its normal load - enough gasoline to get back to India." Even Time Magazine, which has always insisted that more attention be paid to the Atlantic front, accepted Arnold's reasons. The publication pointed out that a China-based force of 400 bombers and 100 fighters - "to take an arbitrary but respectable figure" - would require 75,000 tons monthly of gasoline, bombs and ammunition, figuring 15 offensive missions a month for each plane. 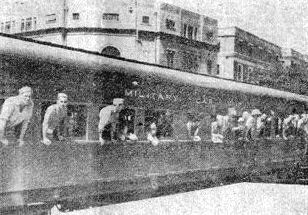 One thousand of the biggest transports made, each making more than twelve round trips every four weeks from India to China, would be required to keep such a force going. But Time wasn't the only one who liked Arnold's speech. From Capitol Hill to the White House and back again, the air general's stock already high, jumped some more. All Washington could well afford to heed his words. Said Arnold, "We have a motto which certainly applies to air operations in the Far East: The difficult we do immediately; the impossible takes a little longer."